Poinciana Village Homes: 3 BEDROOM PLUS DEN OR FLEX SPACE. 1 CAR GARAGE WITH FENCED YARD, screened porch & OPEN PATIO. ROOF DONE IN AUG 2016. A/C 4 YEARS OLD. FAMILY FRIENDLY NEIGHBORHOOD, POPULAR SCHOOLS GREAT YARD FOR PETS. PLENTY OF PARKING. ENJOY THE THE NEIGHBORHOOD PARK WITH TENNIS & BASKETBALL COURT. PLAY EQUIPMENT FOR TOTS TOO. NEIGHBORHOOD HAS MEANDERING SIDEWALKS . Poinciana Village Homes: Very nicely updated 3 bedroom home in centrally located Poinciana Village. Highly rated schools and a friendly neighborhood. 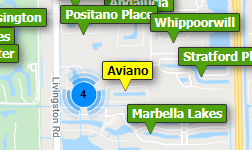 Need professional assistance selling your property at Poinciana Village Naples? Find out how an Area Specialist can help to generate more property exposure in order to get the most money for your investment in the least amount of time.